At Silk + Snow, we’re serious about sleep. We’ve obsessively engineered our mattresses to come up with the next generation of comfort, because let’s face it, you need a quality mattress to get quality rest. Welcome to our blog, where we share information on mattress anatomy, answer commonly asked questions and break down the features that set our mattresses apart from the rest. For all the countless beneficial strains of bacteria out there, there’s also the unwanted types that make us sick, create odours and demand that we stay diligently hygienic. Beds and mattresses are havens for this type of bacterial growth, which is no surprise considering how much they’re used. Beds are constantly exposed to sweat, oils, pets, saliva and all manner of outdoor germs. It’s the main reason why sheets, comforters and pillow cases should be laundered on a regular basis. But what about the mattress itself? It’s just as susceptible to bacteria as these linens and coverings, but considerably harder and more inconvenient to consistently scour for harmful bacteria. This is where antimicrobial silver technology comes in. The antimicrobial properties of silver have long been known.1 That’s why it only made sense to apply the technology to both of our mattresses as well as our latex foam pillow. Read on for more information on antimicrobial silver technology and how it can lead to a cleaner, more hygienic sleep. Bedrooms, and more specifically beds, are ideal environments for unwanted bacteria. Aside from the germs brought into the bedroom by pets and from the outdoors, the biggest culprit of dirty, foul-smelling bedding and mattresses is sweat. While sweat doesn’t smell on its own, it begins to develop its odour as soon as bacteria on the skin begins to break it down. As you sweat during sleep, it collects on your sheets and seeps into your mattress as bacteria continues to break it down. To make things worse, bacteria thrive in moisture-rich environments. Traditional bed sheets and mattresses will retain moisture from our bodies, creating a perfect breeding ground for bacteria. When you consider that we soil our beds on a nightly basis with sweat, saliva and oil from our skin, the conditions only become more ripe for bacterial growth. With this in mind, the benefits of a mattress that can resist this unwanted microbial activity become immediately evident. We weave silver directly into the fabric of our mattresses. Despite silver’s proven ability to mitigate the spread of harmful bacteria, scientists still lack a complete understanding as to the full scope of its effectiveness. What they do know is that the ions that break away from silver nanoparticles during the oxidation process are toxic to bacteria and inhibit their ability to reproduce.3 These silver ions bind with bacteria cells and infiltrate their cell walls, inciting a process called lysis which ultimately leads to their death. Textiles such as mattresses, pillows, bed sheets and clothing are ripe for bacterial growth once they’ve become soiled and retained moisture. Antimicrobial silver presents textile manufacturers with an opportunity to both fight back against bacteria and to create an environment ill-suited for their reproduction. The technology can lead to some of the most advanced textiles in the world if it’s utilized properly. Silver is so effective in these types of applications that it’s commonly used in biomedical textiles to prevent the spread of bacteria-related illnesses in hospitals.4 Antimicrobial silver technology is also leading to significant innovations in areas such as clothing and exercise apparel. In the case of Silk & Snow’s mattresses and pillows, we weave silver directly into the top cover layer of the mattress and the pillow fabric to create a long-lasting barrier that helps to resist bacteria, mould, fungal growth and other microbes. The cover layer also zips on and off, making it easily removable for laundering. A mattress infused with antimicrobial silver can lead to a cleaner, consistently hygienic sleep over the long term. Are There Drawbacks to Antimicrobial Silver Textiles? Silk & Snow ensures against an already minimal risk of overexposure by weaving silver directly into the fabric of our removable mattress cover. This means the antimicrobial properties of the fabric will not degrade over time, nor will the silver rub off onto the skin during sleep or wash off during a laundry cycle. The Silk & Snow Memory Foam Mattress is made with three layers of high-quality foam, that provide a combination of durability, support and luxurious comfort. The antimicrobial silver-infused mattress cover resists the growth of unwanted bacteria and other microbes while you sleep. It’s also fully removable and machine-washable. Additionally, the high-density comfort layer utilizes an open-cell structure and thermo-conductive gel foam which can help to reduce night sweats, thereby exposing both your mattress and your bedding to less moisture. 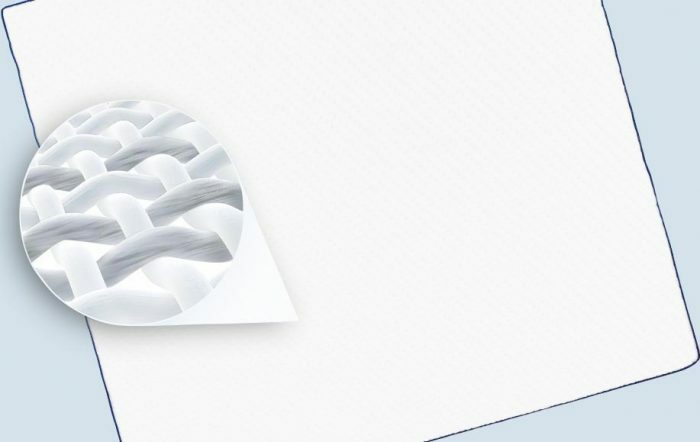 The Silk & Snow Hybrid Mattress is also infused with our innovative antimicrobial silver textile. The individually-wrapped pocket coils made of double tempered steel which work independently of each other for better support and reduced motion transfer. The Hybrid also contains three layers of foam: a layer of high-density support foam, a layer of 3 lb gel memory foam and a top layer of cooling gel foam.